Thamesdown Rotary Club recently joined forces with other Rotary Clubs within the area, whereby each contributed the sum of £1,000 to support a new charity known as Action Through Enterprise (ATE). Its founder and chief executive Sarah Gardner, and the success of the venture is an inspiration to all. This is her story. In February 2012, Sarah Gardner, a primary school teacher, was granted a sabbatical from her job to spend a year working for Voluntary Services Overseas (VSO). Posted to Lawra – a remote area of Upper West Ghana close to the border of Burkina Faso, Sarah found it very remote and very hot. Her role was as a Teacher Support Officer, tasked with improving standards in 96 primary schools. The UN Human Development Report 2010, describes Lawra as a community with chronic food shortages and 100% poverty incidence. As a result of this, Sarah’s isolated house was always surrounded by children. She built relationships with these children and their families, learning about the needs of the community, listening to local people and creating trusting friendships. During a much-needed holiday, Sarah told her family about the situation in Lawra and they in turn immediately offered to do everything possible to help. By the end of October, Action Through Enterprise (ATE) had been born and Sarah decided not to return to teaching. ATE is a UK registered charity, and a registered NGO in Ghana, working specifically in Lawra, to address some of the issues Sarah had identified through her work. Already ATE has achieved fantastic results in improved attendance of hundreds of school children through the provision of free school meals and enabled small business owners to continue to gain new skills and make greater profits to support themselves and their families year-round. We are also immensely proud to make it possible for families with disabled children to overcome isolation and discrimination, and find renewed strength to raise their children to fulfil their potential. We believe in the power of working in partnership with local people to enable them to thrive, to promote economic development and improve the quality of life for all people in Lawra District and the surrounding areas. We also believe that the positive impacts we are having should be deepened and expanded, to reach more people in the Upper West who experience the struggles of living in poverty. Please follow the link above to learn more about ATE. 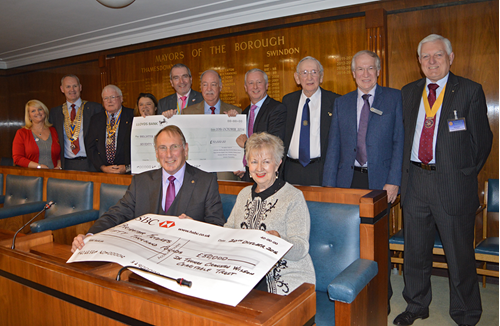 A special event was held on Thursday 20 October, hosted by the Mayor of Swindon Eric Shaw, to recognise the efforts of local people and to receive three substantial donations which tipped the appeal total into seven figures. Rotary Clubs from Swindon, Marlborough and Royal Wootton Bassett who together raised £70,000 exceeded their target thanks to their amazing fundraising efforts and a generous donation from Swindon North Rotarian Tony Long. The Dr Thomas Cranston Wilson Trust presented a cheque for another £50,000 which was pledged to match the challenging target that local Rotarians set themselves in their 15/16 year. During the evening, talks were given by Roger Hill, Chairman of Great Western Hospitals NHS Foundation Trust, Rotarian Howard Small and Dr Claire Blesing, Clinical Director Oncology and Haematology at Oxford University Hospitals NHS Trust. Jennifer Green, Head of Fundraising said: “We’re so thrilled to have reached the £1 million mark and we continue to be amazed and humbled by the efforts and generosity of local people to help us reach our goal. Every penny raised is a step closer to bringing vital cancer treatment closer to home for families in Swindon and Wiltshire for generations to come. All money raised for the Radiotherapy Appeal will go towards the £2.9 million needed to fund the new Oxford University Hospitals NHS Foundation Trust radiotherapy unit on the Great Western Hospital site. Cancer patients in Swindon and Wiltshire currently face weeks of daily visits to and from the nearest radiotherapy centre in Oxford for treatment. The Rotary Club of Swindon Thamesdown raised $35,000 dollars, approximately £22,000, during a two year period to enable the purchase a School mini bus for children in the village of Ozarichi, in the Kalinkovichi District of Belarus. The money was raised with the aid of a matching grant, which the Rotary Club successfully acquired from Rotary District 1100 and America. Working with a Rotary Club in Belarus and also the Swindon Branch of the Chernobyl Children in Need Charity, the bus was purchased to enable the transportation of local children to and from the village school. It is also used for school trips to school music festivals, additional educational classes and is in constant use throughout the week. It also takes children to visit a specialist hospital in Minsk, which is a 6-hour return journey and now enables children from outlying hamlets in the district to attend a Kindergarten school in the Village. The bus is also used to transport food parcels paid for by the Chernobyl Children In Need Charity, to needy families in the Village and surrounding area. The School in Ozarichi is close to the Chernobyl exclusion zone and children from the area suffer from poor health owing to contamination of the soil following the affects of the Chernobyl nuclear disaster, which occurred during April 1986. Over 70% of the highly polluted cloud landed in the south of Belarus and 21% of the land is now contaminated and will remain so for many hundreds of years. As a result of eating food grown in the contaminated land, many of the children now have very low immune systems, thyroid, cancer and heart problems. Members of the Rotary Club of Swindon Thamesdown; Steve Davison and Richard Goddard along with Adrian and Theresa Walker from the Chernobyl Children In Need Charity were invited over to Belarus, by the Kalinkovichi District Head of Education to officially handover the keys of the mini bus to the School. The Rotarians said that it was a enormous privilege to meet the children, their parents and the teachers. Below is a copy of the Kalinkovichi Local Newspaper with an article regarding the Belarus bus project. The article was sent from Belarus to the club and the text is translated below. The representatives of Rotary Club of Swindon Thamesdown came to Ozarichi school in March for a minibus presentation. They had been raising the money for the minibus for 2 years and it was a great present for the schoolchildren. The schoolchildren prepared a concert for their honoured guests, Kristina Grudko, Anna Daineko, Dasha Belenkova sang songs. The pupils of 3-4 forms showed some acrobatic exercises. The guests were pleasantly surprised by the performance of the pupils of the fourth form who staged a fairy tale in English. It was a warm meeting. The children were happy to get a minibus which will be used for giving them the lifts to many places and the guests were touched by their warm and friendly reception at school.